You know what I’m always down for? A good snack. While I don’t LOVE football season, I’m always down for snacking season. Especially during the holidays. Today I come to you with a classic dip recipe that we’ve probably all had at one time or another. And if you haven’t had it, well then you’re in for a ridiculously good surprise because this dip is ALWAYS a crowd-pleaser. 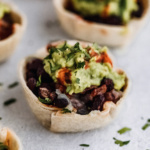 Bring it to a baby shower, your Grandma’s birthday party, football parties, the office holiday get together, BBQs or even into your bed for a late night snack. Wherever you enjoy it, it’s going to be GOOD. So, what is a seven layer dip anyway? Basically just layers of deliciousness served with chips for dipping. You know, the good things in life. First we start with refried beans. 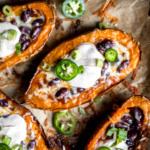 I love refried black beans and bonus…you get a gold star if they’re vegetarian! Traditional refried beans often contain animal products, so check your label if you are vegetarian. Next comes the taco layer. 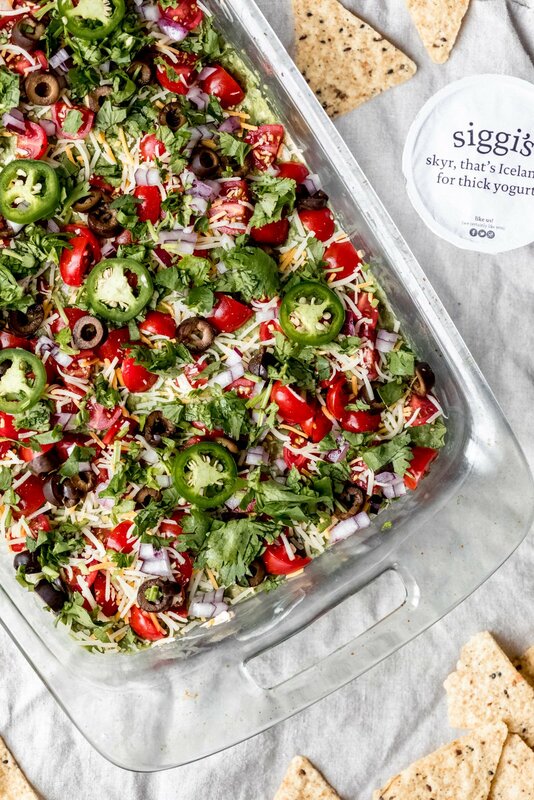 This is where we lighten things up from the traditional version because unlike most 7-layer dips that use sour cream or cream cheese, we’re using siggi’s plain yogurt, which adds an extra boost of protein. I’m obsessed with siggi’s and probably will be my entire life. They make yogurts (or skyr as they call it in Iceland) with less sugar and higher protein compared to most yogurts on the market. To make the layer: the yogurt is mixed with taco seasoning but I’ve included an option to make it with DIY taco seasoning if you’re into that! Then, we’ve got some easy homemade guacamole: fresh avocado, cilantro, jalapeños, lime juice and a little salt and pepper. My favorite thing to do? Taste test with a chip or two before you layer it on. You know you want to. Lastly, we’ll top it off with a little cheese, grape tomatoes (they hold their shape best), black olives, diced red or green onion, cilantro and jalapeños (if you like a little spice). 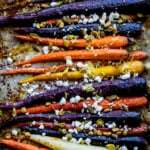 You can serve it with tortilla chips, pita chips, carrot sticks, celery or cucumber slices. I recommend my personal favorite: plantain chips. 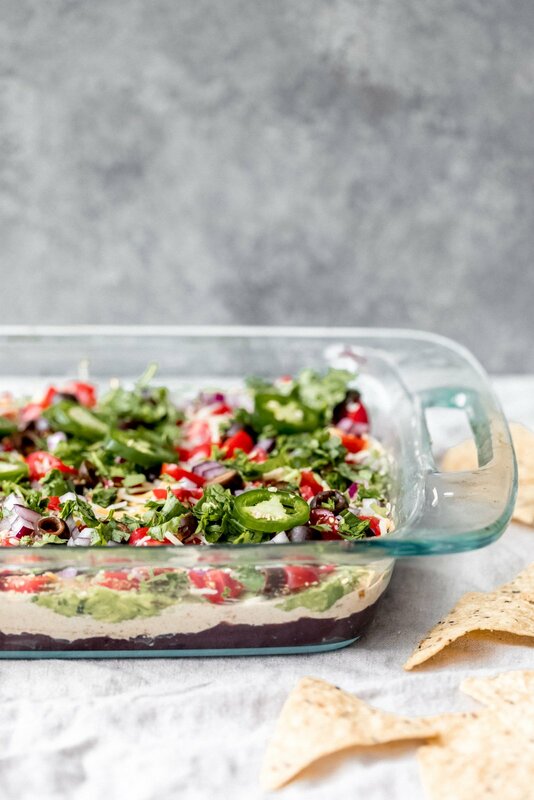 Time for me to stop talking, and time for you to start whipping up this healthy 7 layer dip. You can make it up to 24 hours ahead of time, but I always think it’s best to make the day of. Enjoy! P.S. 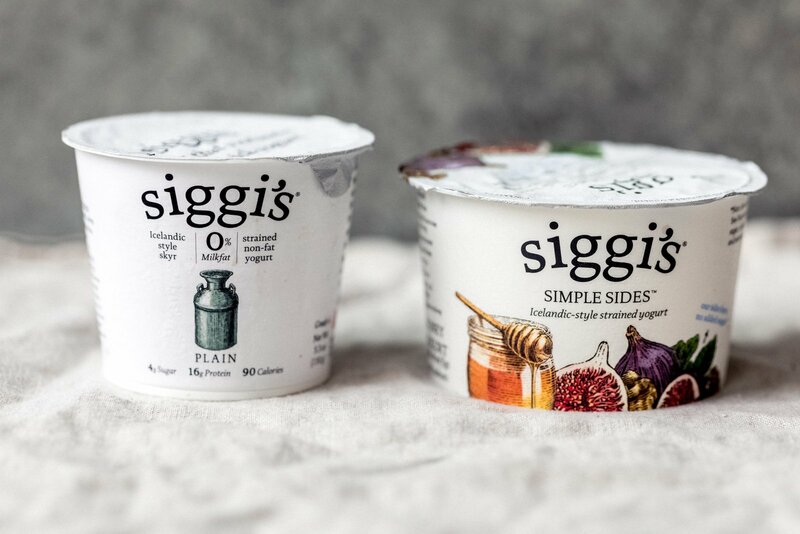 One more note about my siggi’s obsession that I wanted to mention: I’m also VERY in love with their new SIMPLE SIDES (omg the honey one is too good). 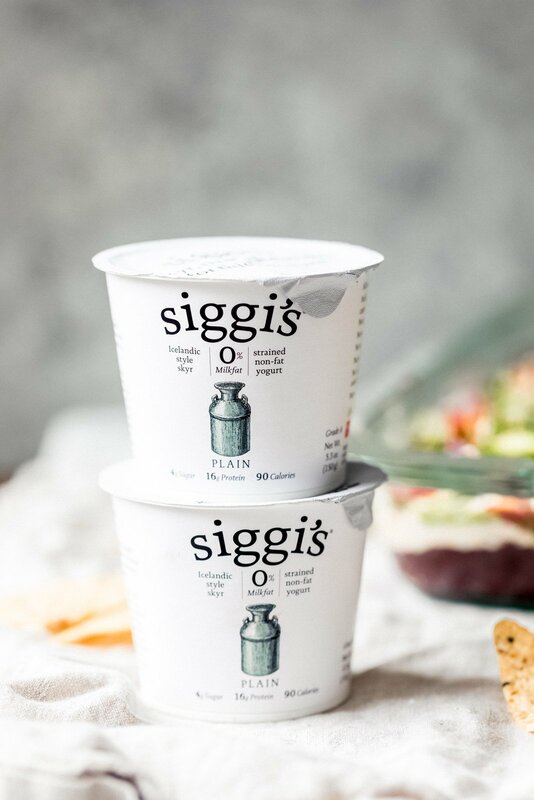 One of the best ways I like to practice a little self care during the busy fall + winter holiday season is to stock up on better-for-you snacks like siggi’s. If you’re interested in ways you can get a little more self-care in your life, check out my 7 day self-care challenge. 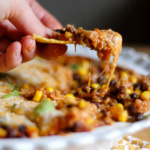 If you make this recipe, don’t forget to rate it and leave a comment below. xoxo — happy eating! 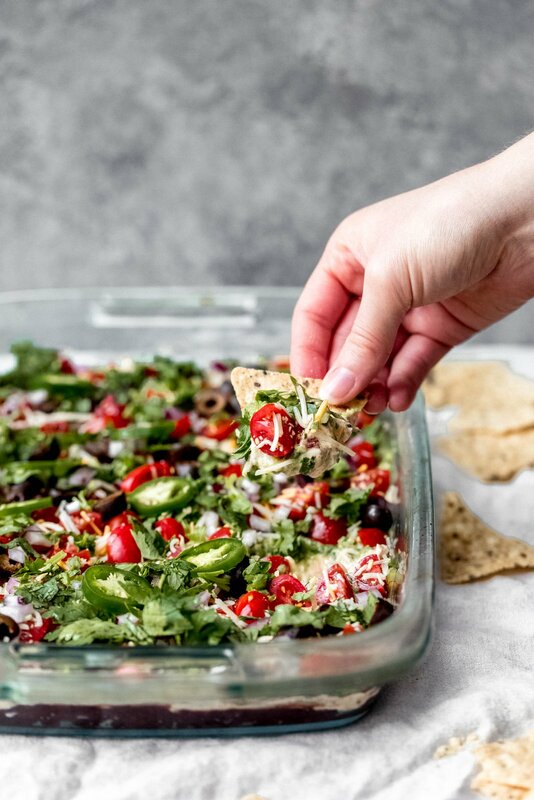 The BEST healthy 7-layer dip ever made with beans, yogurt, taco seasoning, guacamole, cheese, tomatoes, black olives, onion, cilantro and jalapenos. Fresh, flavorful and absolutely delicious! Always a crowd-pleaser for game day and even holiday parties. This recipe is sponsored by siggi’s. Spread refried beans all over the bottom of a 9x9 inch pan. In a medium bowl, mix together the yogurt and packet of taco seasoning (or DIY taco seasoning). Spread on top of refried beans. 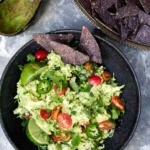 In a separate medium bowl, mash avocados with a fork until a mix between smooth and chunky. Stir in cilantro, jalapeno, lime juice and add salt and pepper to taste. Spread on top of yogurt. Finally, add remaining layers in the following order: shredded cheese, quartered grape tomatoes, sliced black olives, diced onion, cilantro and a few jalapeno slices. Cover and refrigerate until ready to serve. 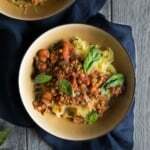 Recipe be can be made 24 hours in advance, but is best to make the day of! Serves 10. 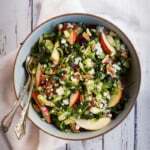 Serve with tortilla chips, plantain chips, pita chips, carrot sticks, celery or cucumber slices. 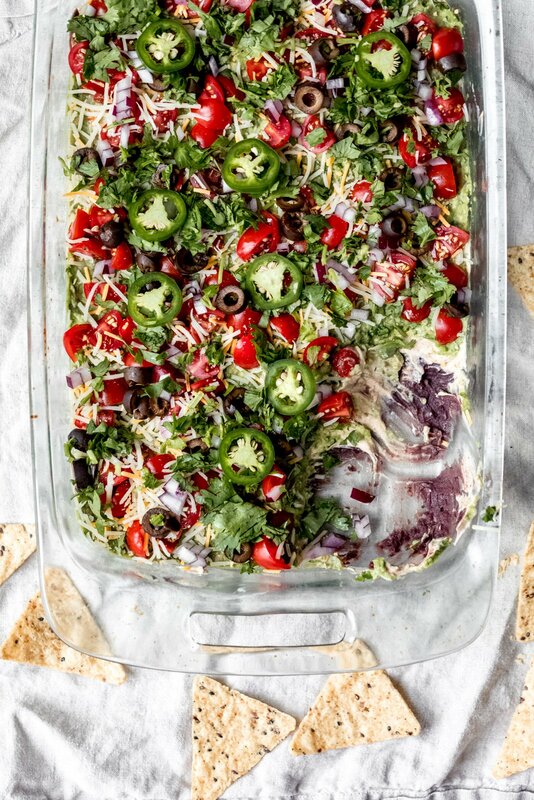 18 Responses to "Fresh & Healthy 7-Layer Dip"
Definitely going to try this recipe. Won’t look as good as yours thou. YES to layered dips! One of my favorite things to bring to parties. Plantain chips are also my favorite! Yum!!! I’m definitely going to try this! For some reason, I can’t pin anything from your blog anymore. I even tried on my phone too. It doesn’t work. Am I the only one? Hope you love this one! And yes – we’re currently working on a fix for the pin button. Apologies for the inconvenience! Wow will try the recipe this weekend for our party! Hope you loved it, Rhonda! Plain Greek yogurt will work! 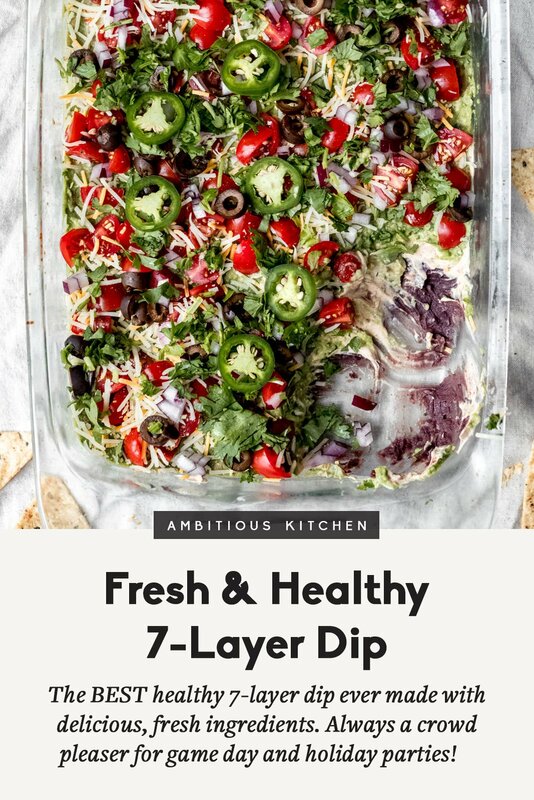 I love 7-layer dips!! I’ll definitely have to try your version! It looks amazing!